I’m sure you thought I forgot all about you. It’s okay. You can admit it. Well, kids. I’m here to promise you that I haven’t. I just needed a small bit of a break from writing for the blog, that’s all. But I didn’t desert you completely. In fact, Leroy and I have been pumping out TWO podcasts a week (Let Us Podcast and the new Walking Dead companion podcast, Stuff & Thangs), and between recording those, working at the comic shop non-stop, researching equipment to expand and better the podcasts, writing for personal reasons, editing and packaging a very special upcoming Halloween-themed podcast, and well… watching Breaking Bad in its entirety, there’s not much room for anything else. Note how much I put in there about podcasts. This is serious business, kids. We’ve got big things in the works. Regardless, I wanted to drop by and talk a bit about something I normally don’t discuss: casual gaming. I’m not talking about D&D (which I haven’t had much time to play in months), Magic: The Gathering (which I haven’t played since high school), or Monopoly. And yes, Monopoly is a game that is anything but “casual.” It breaks friendships. 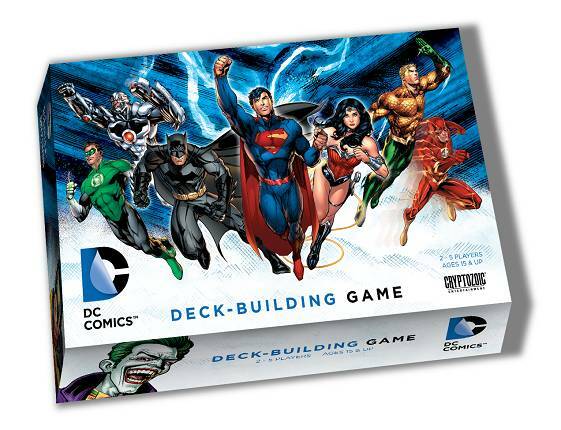 Cryptozoic Entertainment released the DC Comics Deck-Building Game almost a year ago, and I’d had my eye on it for the past couple months, but I wasn’t able to sit down and play a few games until last week. It was my first deck building game, but even as a complete foreigner to the idea, it was an astoundingly simple concept to grasp. 1. Each player starts with a deck of 10 predetermined cards. He/she draws 5 cards per turn, playing or discarding ALL cards from the hand each turn. 2. Players use the card effects and powers (adding to Power level, attacking others, drawing cards, etc.) to amass as much Power per turn. 3. Players use said Power to either purchase cards from a line-up pulled from another OR to defeat Super-Villains.4. When the Super-Villains are all defeated, the players total the card values from their respective decks. Highest score wins. Now, that’s a super-simplified version of the rules. There are chances to defend against attacks, locations, bonuses, weaknesses, and a slew of other small mechanics that become second nature after a few hands. Most places sell the whole set for $30-40, which isn’t bad when you take into account that 2-5 people can play this same set of cards time after time and have radically different games every sitting. While some prefer games in which each player builds his or her own deck and brings it to play (like the aforementioned and ubiquitous Magic: the Gathering), gamers on a budget may gravitate to a game like this, one that provides hours of play for a one-time expenditure. Well, until the expansion releases this winter, that is.